I've always eaten a pretty good diet, but for the last 3 years, I've really focused on better, healthier eating on a consistent basis. As a result, my immune system is stronger, my cholesterol levels (LDL and HDL) are awesome, and I've lost over 20 lbs which I've kept off. Weight loss was not my main goal, but it was a nice benefit. Being healthy was and is my priority. Below are 10 tips I have to offer in helping you transition to a healthier eating and a healthier lifestyle. 1. 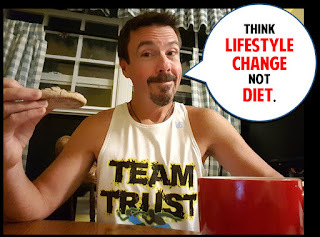 Think Lifestyle Change not Diet. If you're thinking of "diet" in the sense of what foods you're eating, that's okay. But if, "diet" refers to something you're "going-on" more than likely you won't succeed, or if you do, eventually you'll return to your old eating habits. I'm not being pessimistic. Research shows, that most diets, in particular very restrictive diets, just don't work in the long run. When changing your eating habits, you need to think, "Is this something I'll be able to continue doing for a lifetime?" 2. Take Ownership of Your Eating and Lifestyle Change. I've had new prospective clients come to me and say, "I need you to get me to lose 20 lbs in a month." Red flags immediately go up when I hear this. When I hear, "I need you to get me..." I know right off the bat, this person isn't ready to take ownership of the changes ahead. I learned way back when I was 13 years old that someone can't change until they're ready to change. I was an overweight kid. My parents and friends often tried to get me to do various things to lose weight. But it wasn't until the summer before entering high school when I decided that I didn't want to go to high school heavy, that I was ready to make a change. At that young age, I took ownership of the situation and changed my eating habits and lost weight. 40 lbs to be exact, before my freshman year. 3. Expand Your Eating Horizons. Take a field trip to the grocery store. Shop the perimeter of the store. That's where you'll find all the fresh produce and meats. Most of the processed and packaged foods are in the center isles. Check out the fruits and vegetables. Pick them up. Feel them. Read the tags and labels. Pick something to try. I did that with Brussels sprouts and now they're my favorite veggie. I've learned to cook them in several different ways. Eat the rainbow. Fruits and veggies rich in color often contain the most nutrients. Incorporate a variety of dark green veggies. Kale is a super veggie full of nutrients and antioxidants. It can be added to salads, eaten cooked, and even added to smoothies! Sweet potatoes are another nutrient dense food. They can be baked whole or sliced and baked on a sheet brushed with a little olive oil. They're awesome! 4. Pay Attention to What You Are Eating. It's a given that you should pay attention to the types of foods you put in your body, but also, pay attention to the "act of eating." Think about it. How many times have you gone to the cupboard for a snack and then before you get back to the couch you've eaten it all? So what do you do? You go back and get more. How many times have you picked up fast food and eaten the fries out of the bag on your way home. Then all you have left is that burger or sandwich. Even though you've already eaten the fries and should be somewhat full, you don't feel satisfied, because all that's looking at you on the plate is the lonely burger. Another good trick is to portion your snack. Have you ever grabbed a box of crackers or chips and before you know it the bag/box is empty? Instead of eating out of the bag or box, pour a single portion size in a bowl to eat. That way you're more aware of how much you've eaten. Learn to pay attention to the food you are eating. 5. Eat at Home or Prepare Your Meals for on the Go. Eating out is the easiest way to rack up the calories. Most fast food and even sit-down restaurant meals can contain an entire day's worth of fat and calories....in one meal! That doesn't mean you have to pack carrot sticks and celery for lunch. Remember, you're not on a diet. Preparing your own meal gives you control over what goes in it. You know exactly what you're eating. You'll also save money. Even if you eat a fairly healthy meal at an establishment such as Subway, you're going to pay $6-$9. That's $30-$45 for lunch in a 5-day work week. 6. Stop Drinking All Your Calories. Sweet Tea and regular sugary sodas are full of empty calories. Drink water or unsweetened tea with lemon. At first you'll miss the sweetness, but you'll eventually get past it and actually enjoy it. 7. Splurge Every Now and Again. There are times to celebrate and sometimes, that means enjoying foods that may not be so healthy. That's okay. There is a time for birthday cake. There is a time for pumpkin pie. There are times for those favorite family foods. When you save those special foods for special times, they actually taste better. Just be sure to eat a moderate portion. Earth Fare has a "Top of the Day" muffin that's pretty awesome. It's really pretty healthy for a muffin, but I know it's probably high in calories. Each Friday, if I've gotten in my weekly runs and workouts, I'll treat myself to that "Top of the Day" muffin for breakfast. That's my special treat. I look forward to it. Find your weekly special treat. This may not work for everyone, but what will work is having a regular routine beginning with breakfast and not skipping meals. 9. Watch the Red Meat. Nothing wrong with having a good burger from time to time. But more and more research suggests that limiting your intake of red meat helps reduce your risk of colorectal cancer. The American Institute for Cancer Research suggests limiting red meat intake to 18 oz (cooked weight) weekly. 10. Begin with Small Changes. Evaluate what you're eating. Decide on one thing you can stop eating or replace with a healthier option. Small changes like this will lead to big changes over time. Do you really need that mid morning doughnut? Eliminate it or eat an apple instead. That could save 1300 cals and 80g of fat in a work week! One small change. One big effect. Once you see that changes the small change is making, then make another small change. My son lost over 100 lbs using this method. He mastered what I call the art of moderation and accountability. Have that pizza once in a while, but instead of 4 slices, have two. Or maybe just one slice with a nice salad with lowfat dressing.